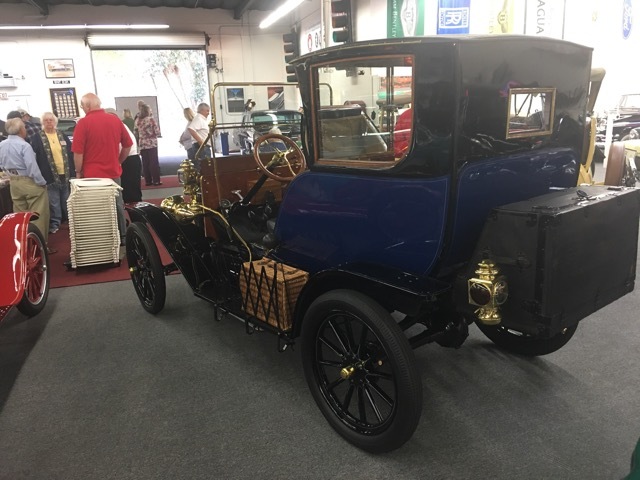 On Saturday I visited a local private museum and came across a rather unusual bodied Model T. The Museum owner bought it about six months ago and was told it was a 1909 Model T with the body built in France. I can confirm that most of the mechanicals are not 1909, starter engine, later springs, cast rear axle, the list goes on. However the body is very unusual with just a drivers seat, luggage space and and moving area for easy access to the rears seats. The last picture shows a wedge on the steering column like we use on Speedster so clearly the front seat has been moved backwards. Has anyone seen anything like this previously? Any ideas on who built it and when? 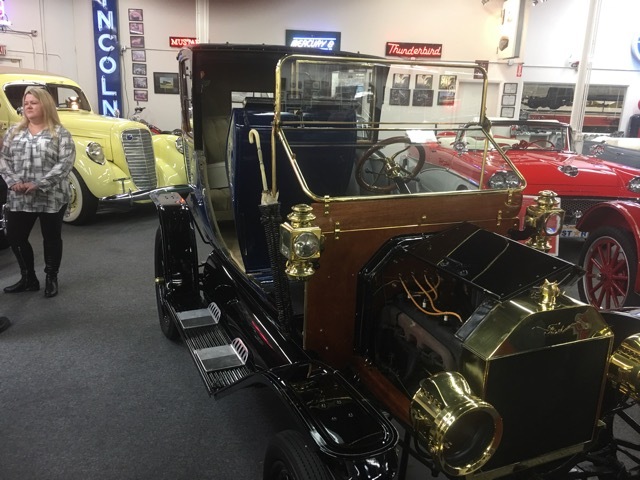 The owner would love to have more history on this beautifully crafted Model T.
Looks like a horse-drawn hansom cab body that was adapted to a Ford. Maybe it is a recent "marriage" of the body to the car? Wasn't that car discussed on the forum within the past year? That car was pictured and discussed here, maybe about a year ago. Time flies, could be closer to two years, or less, I don't know. But I remember that body, and the not 1909 chassis. He likes the sun and she likes the shade! Body has the earmarks of a Hansom, but there are too many differences for me to think that it's a "repurposed" Hansom. Most likely "just" a unique one-off from a French coach builder if that provenance is correct. Maybe it was built for a Model T chassis, but probably not the one that's under it ? Could also be a body from a motorized/electric Hansom. I don't understand why when cars are bought and sold, the history isn't passed along or the buyer simply doesn't ask the seller more questions. Something that unique should have some sort of provenance whether it goes back only a few years, fifty years or 100 years. The current owner calls it a 1909, yet it is not. That alone says to me the story about it being a French body is also questionable. Just my two cents which is neither here nor there. Erik, I agree! Regardless where everything came from, it's together now in a presentable (and hopefully driveable) state, and being preserved. The story behind it is likely very interesting, no matter the details. Knowing something of that history would be of great interest, if not right now, perhaps in the future. A "story" is worth the telling "even" for the so-called "bitsa" Ts, I think. Even with the steering column bracket shim, the geometry is very bad - steering wheel is in your face when sitting that low. The body may have come from another automobile and transplanted on a Ford. Again, just more of my opinions. By definition this is not a bitsa. There is enough information and history to indicate the car has a history. 176.7 cubic-inch side-valve L-head four-cylinder engine rated at 22 horsepower, two-speed planetary transmission, solid front and live rear axle with transverse semi-elliptical leaf springs, hand-operated rear-wheel mechanical brakes. Wheelbase 100-inches. Ford�s Model T was one of the most popular and versatile cars ever built. Sedans, phaetons, coupes, convertibles, roadsters, and pick-up trucks were all built by the millions by Ford, but one model that saw very few numbers in the Model T line-up was the town car. Usually reserved for grand cars like Packard, Marmon, Stutz, or Duesenberg, the town car was the tool of the elite. By separating the proletariat chauffeur from the wealthy owner, the town car enabled its rear seat occupants to chat in privacy, while the driver sat outside exposed to the elements. The town car�s design was elegant, sophisticated, and long, which is what makes this Model T town car so interesting. Not only is it a truly opulent car built on a simple Model T platform, but it also features several styling cues that are seldom seen on any car. 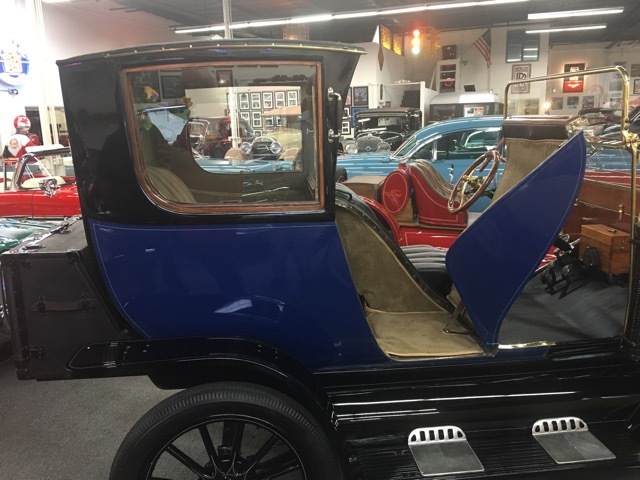 The original history of this Model T town car that once resided in the Austin Clark collection is not known, but we do know that it followed the general rule of thumb for the affluent in society, in that the chassis was updated to allow for the latest in technology. In this case, this 1909 body was fitted to a later Model T chassis from the 1920s. This allowed it to be used for several more years beyond its expected lifetime. No coachbuilder tag is present on this car, but its finely sculpted lines and elegant styling suggest French origins. A most unusual arrangement is found in the entrance to the rear whereby an aerodynamic cover is found in place of the front passenger seat, which lifts-up to allow for entry. There is no other town car that uses this unique styling cue, which makes this one even more interesting. Rear passengers are treated to furniture style comfort in a compartment that features elegant trim appointments that are usually found on a Packard or Cadillac. 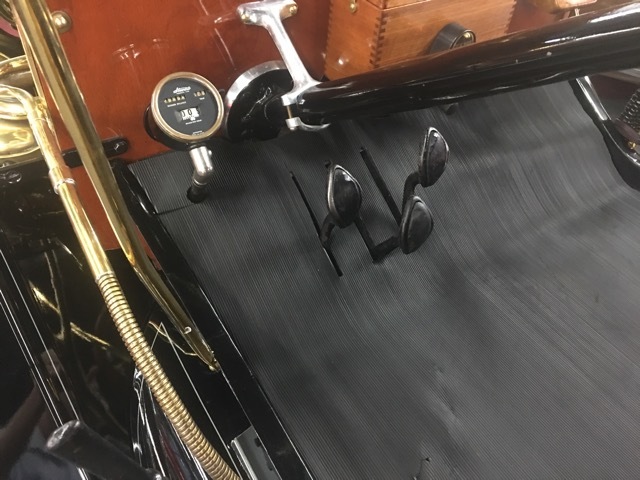 The open driver�s compartment operates like a Model T, but has an elevated degree of sophistication, with beautifully finished woodwork and a large steering wheel. As this town car rides on a later model chassis it is also, equipped with an electric starter. Other stylish features include; a side mounted wicker basket, rear luggage trunk, brass head lamps, a brass bulb horn, and a folding front windshield. This Model T also wears a beautiful restoration that is both authentic and highly detailed. The town car was a specific car for a specific use and this Model T town car is a most unusual example of this purpose-built car. Perhaps, it was used as a second car at the estate, or even a car to take her ladyship into town. Whatever its purpose, this most uncommon car has no equal in terms of eccentricity. No collection is complete without that unusual artifact and this Model T does all that and more. I am not that familiar with this model but should the red lens be pointing to the rear? Despite the long narrative above from the auction listing, the history of the car contained therein is actually quite vague. The first paragraph is fluff and typical of an auction house listing. The only historical fact in the second paragraph, which I presume is substantiated, is that it was once owned by Henry Austin Clark, Jr. Otherwise, the paragraph appears to be speculation (per "rule of thumb" car was upgraded, body suggests French origins) followed by a physical, not historical, description of the car, the details of which can be seen in the photos. Unfortunately, the person who could shed the most light on the car, Henry Austin Clark, Jr., passed away in 1991. Can anyone figure out if it was restored by Dragone or just sold by them? By the way it is a �bitza�. Tapered front springs and a starter. Next time it visit I�ll check on the approx age of the chassis. It may well have been built in 1909 but there is nothing I could see to substantiate that supposition. I've recently done a good bit of research on Henry Austin Clark. One thing you find out pretty quickly is that he had no hesitation putting a car together from parts, even at times if those parts were never in the same manufacturing facility at any point in their existence. I would venture a guess that, since the history of this car seems to START with HAC ownership, then in his collection is when the assemblage was birthed. I really don't want to say much against Henry Austin Clark Jr. He as much as anyone else of the couple hundred people that really built the foundation of our hobby of antique automobile restoration and preservation did a lot to make possible what we do today. He personally saved literally hundreds of valuable (historically only at the time) automobiles. His personal collection included many of the most prized cars in existence today. He collected a tremendous amount of literature, creating one of the first antique automobile research libraries, and his personal collection providing the foundation of a few of the most valuable such libraries still used today. He was a founding member of several of the more important major clubs. And he wrote several books, including some continued by Beverly Rae Kimes, that are important reference materials still. But a few of his favorite cars were, in fact, made up. Another few sad facts of our hobby. More than 95 percent of all the cars we could have loved in this hobby, cars built before 1930, were either junked when they became damaged or worn out, or fell victim to various scrap metal drives. Of the less than five percent that survived? Most went through a couple decades when they were just "old" cars. Basic transportation maybe, sometimes a mostly forgotten relic in back of the barn, once in awhile, a piece fondly remembered for a time. Our surviving antiques also had to survive two of the worst decades (so far) in modern history. The entire 1930s, were a time of incredible hardship. Economic collapse around the world. Even among the wealthiest nations on Earth, millions of people struggled just to survive. By the mid '30s, war loomed heavily over Europe. Through the first half of the 1940s, that war became the most immediate concern to nearly every person on Earth. Again, just surviving was paramount. Is it any wonder that the individual history of most "just an old car" was lost in all that shuffle and struggle? That, unfortunately, is a reality we need to accept. Along with that, we have to take a lot of cars at their face value. Interesting and unusual special bodies? Many such cars were built. If properly done, even recreations should be treasured as examples of what used to be. The particular car in question? Maybe it should be kept just the way it is. It was, however, "Austie's". On the other hand? If it were me? I would be tempted to return the car to an earlier configuration. Without documentation, to confirm some claim as 1909, I don't think I would consider trying to assemble enough true '09 parts for that. But 1912 would be properly fitting for such a body. And the 1912 parts aren't that difficult to get. But before I would commit to a final opinion on that, I would have to see more of the car, and try to determine just what it really is. But that is just silly me. Besides. I don't really have any say in the matter. I do hope the new (current) owner likes and appreciates the car. I hope, however he chooses to keep it, he drives it, enjoys it, and it can be seen out and about often. Wayne, well said. Hundreds of early cars were "rescued" by "Austie", and through him entered the main stream of collectors. I have a 1931 Pierce that went through his hands in the 1950's. It's very true that we owe him a lot, and my comment on him putting together cars was not a criticism, just an observation. We don't know if Henry Austin Clark found this car as shown or if he married the body to a Ford chassis. I am willing to bet when he had this car, Clark probably created file on it: where he bought it, from whom, price/how much, a record of money spent on restoration, etc. I would think that being who he was, he would have passed along any information that he had on the car when he sold it. As I posted earlier, unfortunately, when these cars change hands, the history is always not passed on to the next owner. Or, if the history is passed along, a subsequent owner doesn't bother to pass it a long when he sells it, etc. David C, I know you weren't criticizing him as well. My comments also were not meant to criticize. It is just a fact (as I know you know, and thank you for the compliment). DC & EJ, Yeah, years ago I had a '25 Pierce Arrow that had been owned by William Harrah. In speaking with other owners of former Harrah's cars, I found I only had about half of the paperwork that should have been with it. When I had to sell the car, I made sure all I had went with it. From what I have heard since, the since current owner probably doesn't have any of what I had, and couldn't care less. Very sad. The car deserved better. Another car I had and sold even more years earlier, one day about thirty years later I stumbled into it being offered "for sale". So of course I had to check it out. None of the research I had had was with it. Neither were some parts I had made for it along with extra parts I had bought that were needed for proper restoration. If I had my way in my life? I would have kept every car I ever had. And taken good car of all of them. But I could not do that. It makes me sad every time I sell a car I want to keep (getting ready to do that again darn it), not knowing if the new owner will actually take care of it. Sadly, too many of the cars I have had, I found out later they did not. One exception. My '15 Studebaker went to a very good friend of mine, and he has done much better than I ever could have. It looked good when I had it. It looks incredible now. Wayne, do you have a photo of the Studebaker you could share? "The Long Island Automotive Museum Vehicles subseries is comprised of records, data and research material related to vehicles in the collections of LIAM and museum operations. Files include photographs, museum postcards, correspondence, certificates of title and sales, registrations and material related to vehicle maintenance and restoration. Some files include advertisements and other product literature related to the vehicles. The subseries is arranged alphabetically by vehicle and then chronologically." If you look at the PDF, you'd have to pull boxes 8 and 9 to see all the Fords and see if there is a file that pertains to the car in question. I would also pull box 6 which includes administrative and auction information, etc. The George W. Copp Co. information on file is literature, etc. and probably does not pertain to the car in question. The Ames information is literature. Wayne's posting mentioning the hardships of the depression reminded me of the organ builder I worked under. He related that in the late 1930s he bought a Cadillac V-12 and cut it up for the aluminum, as no one could afford the gas it guzzled. Somewhat related; today, good, even great, pianos are going to the dumps, as no one wants them! !